On all lists of the best science fiction and fantasy writers of the twentieth century, Ray Bradbury is always present, and usually at the top. However, popular acclaim does not always translate into high literary craft. The discerning reader should carefully look at the full body of Bradbury’s writings to determine if all, or even some of his works, merit scholarly attention. He sub-created worlds that explored the widest range of human experiences and humane themes. Often he spoke about his dislike of being classified in genres he believed were artificial. As an author that transcended and sometimes blended narrow genre classifications, Bradbury saw himself merely as a writer. While his stories have the common features of science fiction and fantasy, these characteristics were simply functional toward the greater end of telling a fine tale about human beings being human. Even though there are dangers facing humanity, repeatedly the greatest dangers in Bradbury’s stories are not hidden on Mars, not found in big government, but common human beings who have forgotten what it means to be fully human and fully alive. While fiction is about a great deal more than ideas, such as the delight in the story, and the way that stories move us as humans, there are ideas and ideologies in fiction. The short stories and novels of Bradbury speak of the widest range of human experiences and ideas. Drawing from Mortimer Adler’s list of the great ideas in humane letters, readers have noted that within Bradbury’s body of work, one encounters beauty, chance, change, citizenship, courage, custom and convention, desire, duty, emotions, eternity, evolution, experience, family, fate, God, good and evil, habit, happiness, honor, immortality, judgment, knowledge, law, life and death, love, memory and imagination, nature, opinion, opposition, philosophy, pleasure and pain, prudence, punishment, reasoning, religion, senses, sin, soul, temperance, time, truth, virtue and vice, will, wisdom, and world. While some misguided critics have observed a Norman Rockwell nostalgia within a few of Bradbury’s works, these same critics are blind to the George Orwell echos in these same pieces. In Dandelion Wine there are indeed glimpses of old, small town USA, but within this town there is a serial killer and more than one profound statement about the loss of our humanity to the ever present technological temptation for the newer to be seen as always better. The more astute readers have noted a sense of longing co-mingled with a sense that all is not as it should be within Bradbury’s writings. Both his short stories and the collection of stories crafted into longer novels embody the reality of the fall and ever present signals of transcendence and a hoped for recovery of our garden heritage. While Ray Bradbury’s writings were first found in amateur and pulp magazines in the 1930’s, his stories would eventually be published by Collier’s, The Saturday Evening Post, Esquire and The New Yorker. Not a large number of twentieth century writers can claim that their works were adapted for comics, radio, television, stage and film. Many of these adaptations were scripted by Bradbury himself. Even the film adaptations of The Martian Chronicles and Fahrenheit 451 reached a larger audience, but sadly with much of the rich literary textures and meaningful metaphors lost in translation from the book to the screen. Reading Americans have encountered Fahrenheit 451 (Bradbury’s most recognized novel) at some point in their educational experience. Unfortunately, this great novel has been misread and misrepresented over the decades. To say this work is primarily about, or even mainly about censorship, is akin to saying that The Wizard of Oz is about a yellow brick road. There is censorship in Fahrenheit 451 as there is a yellow brick road in The Wizard of Oz, but only the most superficial reading sees book burning as the primary focus of the work. Reading “companion or parallel stories” such as “The Fireman,” “The Library,” “The Pedestrian,” “The Garbage Collector,” “The Smile,” “To the Chicago Abyss,” and “Long After Midnight” will confirm that Fahrenheit 451 is a masterpiece of dystopian fiction exploring anti-intellectualism and a loss of truth, goodness, and beauty in human civilization. Because of these and related humane themes, Ray Bradbury’s works, as a whole, are in sustained conversation with the Great Books of the Western World. Sometimes these connections are in the form of allusions, sometimes quotes, and sometimes homage by imitating the structure and even voice of a master author. In Fahrenheit 451 and “companion stories” set within this dystopian milieu characterized by disdain for sustained reading, thinking, and conversing, the reader is reminded of the following authors and works: Edna St. Vincent Millay, Walt Whitman, William Faulkner, Dante Alighieri, Jonathan Swift, Gulliver’s Travels, Marcus Aurelius, Meditations, William Shakespeare, Hamlet, Little Black Sambo, Uncle Tom’s Cabin, Samuel Johnson, Edgar Allan Poe, the Bible, Job, Proverbs, Ruth, Ecclesiastes, Revelation, Matthew, Mark, Luke, John, Thomas Jefferson, Henry David Thoreau, Walden, Luigi Pirandello, George Bernard Shaw, John Milton, Sophocles, Aeschylus, Eugene O’Neill, John Dewey, Alexander Pope, Plato’s Republic, Charles Darwin, Arthur Schopenhauer, Albert Einstein, Albert Schweitzer, Aristophanes, Mahatma Gandhi, Gautama Buddha, Confucius, Thomas L. Peacock, Abraham Lincoln, Lord Byron, George Washington, Galileo Galileo, Leonardo Da Vinci, Washington Irving, John Donne, Thomas Paine, Niccolo Machiavelli, Bertrand Russell, Friedrich Nietzsche, the Magna Charta, and the Constitution. There are even story titles of Bradbury that pay literary tribute to his most beloved author Charles Dickens—“Any Friend of Nicholas Nickleby Is a Friend of Mine.” Other stories and authors include, “The Golden Apples of the Sun” (W. B. Yeats), and “I Sing the Body Electric” (Walt Whitman). As with other Bradbury writings, there is often an earlier life or version before the published date. While Something Wicked This Way Comes was published in 1962 (50 years ago and still in print), there were earlier kernel versions in short stories—”The Electrocution” 1946, “The Black Ferris” 1948, a screenplay entitled “Dark Carnival” 1955, another screenplay “The Marked Bullet” 1956, as well as an unpublished first-person novel Jamie and Me. Something Wicked This Way Comes should be read as a companion story to Dandelion Wine. Even Bradbury clustered these two stories with Farewell Summer and called these the Illinois trilogy. Whether read as a moral fable, Christian allegory, or a moralistic horror tale, Something Wicked This Way Comes is a novel that should be rescued from the middle school reading list and the bin of literary obscurity and given due attention. Beyond being a masterfully crafted exploration of numerous humane themes, it is a delightful, at times, but ultimately enlightening, tale about the sin of narcissism and the possibility of human connectedness in the presence of that most damnable of sins. Throughout his life, Bradbury spoke often of his autodidactic formation in library stacks. This is evidenced throughout his writings that show influence by, and respect of, the adventure stories of Edgar Rice Burroughs, Jules Verne, H. G. Wells, L. Frank Baum, Edgar Allen Poe, Charles Dickens, and Herman Melville. In turn, the books and stories of Ray Bradbury have been admired by figures as diverse as Bertrand Russell, Christopher Isherwood, Ingmar Bergman, John Huston, Stephen King, Steven Spielberg, James Cameron, Neil Gaiman and R.L. Stine. As early as 1954 and as late as 2007, Ray Bradbury received prestigious awards such as the National Institute of Arts and Letters Award, two PEN/O. Henry Prizes, A National Book Foundation medal, an Emmy for the screenplay of his The Halloween Tree, and a Pulitzer citation for his extraordinary writing career. 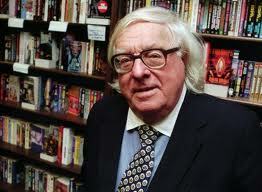 A cursory search of data about Bradbury on the world wide web will yield much contradiction. The political left and political right claim him as embracing their beliefs. In truth, we do know that he considered Ronald Reagan the greatest president, and this is coming from a man whose life spanned sixteen different presidents. Bradbury was also honored by President George W. Bush in 2004 with the National Medal of Arts. Generally, Bradbury was not a political creature in a formal sense. His concern was with communities. People who lived, worked, laughed, cried, feared, conversed, celebrated and died together were at the heart of his writings, not ideologies and political regimes. The true, the good, and the beautiful are constantly manifested. There is also an ever present hint of the transcendent. Sometimes it is a sense of the divine, sometimes a most ominous evil, and sometimes a goodness that moves those of us who love its presence to praise the author of all goodness and truth. Certainly a large part of what I most cherish in his fiction is the sheer celebration of the goodness of being. The very truth that we are, and that life is a gift to be treasured has been lost in much modern fiction. I have discovered an extraordinary amount in Bradbury’s writings that complement and parallel Christian conviction. Bradbury is what I often refer to as “old school humanist.” In other words, he affirms truth, goodness, and beauty. His works even explore, and frequently affirm, the essential nature of faith, hope, and love and other religious virtues. His characters often discuss and embody these realities. Beyond the pervasive sense of joy in many of Bradbury’s writings, reading such short stories as “The Man” and “Bless Me, Father, For I Have Sinned,” the reader is shown the most explicit sense of the residue of Bradbury’s Christian upbringing and the lingering effect of the faith on his soul. I begin my lectures and presentations about Ray Bradbury with a confession. The confession is simple and one of which I express a deep sense of loss and a degree of shame. I did not start reading Ray Bradbury until several years ago. I did not read him because I judged his books by their covers. I had a misinformed sense that I knew what his books would be about because the covers of his books told it all. One cannot be more wrong. It was an endorsement I read on a Russell Kirk book that came from Ray Bradbury. I thought, if Ray Bradbury liked Russell Kirk, and I liked Russell Kirk, then maybe, just maybe, I might appreciate Ray Bradbury. After going to the local bookstore and buying Something Wicked This Way Comes and reading it, I was hooked. My repentance then took the form of reading The Martian Chronicles and the delight and feeding of my mind was tremendous. I immediately went out and bought Fahrenheit 451, Dandelion Wine, and a collection of his short stories. I have never been the same since. As a matter of fact, every Halloween season for the past six years I’ve re-read Something Wicked This Way Comes, and every first day of the summer for the past several years I have re-read Dandelion Wine. For the past few years I have been blessed to visit The Center for Ray Bradbury Studies and gain such insight of Bradbury’s life and writings from the top Bradbury scholar in the world (this is not an exaggeration), it has been equally as exhilarating giving lectures through The Big Read Events sponsored by the NEA where thousands of people read, think about, and discuss Fahrenheit 451. Even in my blogs I have a section “All Things Bradbury” as a partial testament that as a Professor of Great Books, I consider his writings as worthy to be added to the canon of the best books as any penned by modern authors. Russell Kirk once noted with the possible exception of Roy Campbell, “the love of life burns brighter in Ray Bradbury than any other man of letters.”1 Ray Bradbury was born in Aug 22, 1920 in Waukegan, Illinois, and passed from this life in southern California on June 5, 2012. While Ray Bradbury drifted from his childhood faith, one could easily make the case that a specifically Christian and positively religious worldview shaped the bulk of Bradbury’s works. His life and writings demonstrate an eye for the glorious all around us, and his celebration of life as a gift is to be most respected. In a key interaction between Guy Montag and Chief Beatty in Fahrenheit 451, Montag tells Beatty, “We never burned right.” In his life and fiction, Ray Bradbury burned right and leaves for all of us a literary legacy to be enjoyed and carefully studied. An article I authored recently published St Austin Review, S/O 2012 V. 12, N. 5. Reprinted with the gracious permission of Musings of a Christian Humanist. 1. Russell Kirk, Enemies of the Permanent Things: Observations of Abnormity in Literature and Politics (Peru: Sherwood Sugden & Company, 1984), p. 120.